They keep dropping like flies. Just ran into John Bolton at Farragut Square. I asked him about the national security adviser role & H.R. McMaster. Bolton stepped away from me & laughed. Then I asked him if he’d keep the mustache if he was NSA. ... it wasn't until just after 6pm that the NYT reported that H. R. McMaster, the veteran Army officer who was tapped as President Trump’s national security adviser last year to stabilize a turbulent foreign policy operation, will resign and be replaced by John R. Bolton, the neoconservative hard-line former US ambassador to the United Nations. Which is ironic considering that just one week ago.. Upon his departure, Gen. McMaster will retire from the military. The president and the general, who had never met before Trump interviewed General McMaster for the post, had little chemistry from the start, and often clashed behind the scenes. McMaster had struggled for months to impose order not only on a fractious national security team, but also on a president who resisted the sort of discipline customary in the military. Although General McMaster has been a maverick voice at times during a long military career, the Washington foreign policy establishment had hoped he would keep the president from making rash decisions. Tensions between the two seeped into public view in February, when General McMaster said at a security conference in Munich that the evidence of Russian interference in the 2016 presidential election was beyond dispute. The statement drew a swift rebuke from the president, who vented his anger on Twitter. General McMaster carried out a slow-rolling purge of hard-liners at the National Security Council who had been installed by Mr. Flynn and were allied ideologically with Stephen K. Bannon, Trump’s former chief strategist, earning the ire of conservatives who complained that his moves represented the foreign policy establishment reasserting itself over a president who had promised a different approach. Now, just over a year into his tenure, McMaster himself is out. According to the NYT, McMaster had been discussing the process around his departure with President Trump for several weeks, and decided to speed it up "because questions about his status were casting a shadow over his conversations with foreign officials." To avoid the impression of another botched Rex-T-like firing in which the general was sacked while sitting on the toilet, "officials emphasized that General McMaster’s departure was a mutual decision and amicable, with none of the recrimination that marked Mr. Tillerson’s exit." The NYT sources also said it was not related to a leak on Tuesday of briefing materials for Mr. Trump’s phone call with President Vladimir V. Putin of Russia. As was reported, Trump had been advised by his senior staff not to congratulate Mr. Putin on his re-election, which the president went ahead and did during the call. 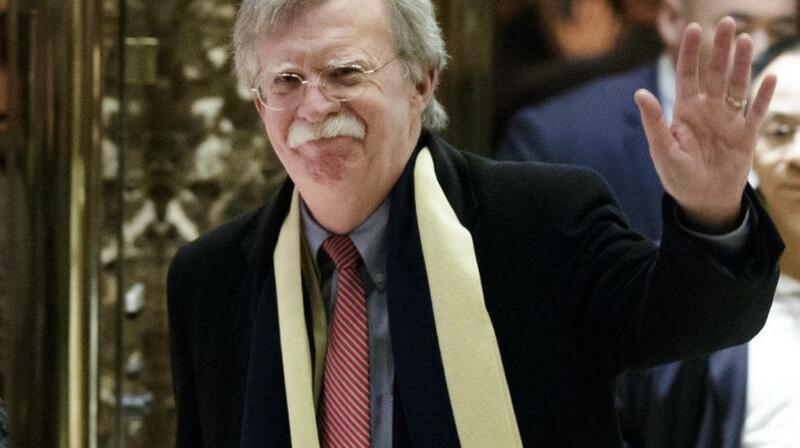 Bolton, who will take office April 9, has met regularly with Trump to discuss foreign policy, and was on a list of candidates for national security adviser. He was in the West Wing with Mr. Trump to discuss the job on Thursday. Incidentally, while Gen. McMaster had been among the most hard-line administration officials in his approach to North Korea, publicly raising the specter of a “preventive war” against the North, and was among those who expressed concerns about Mr. Trump’s abrupt decision this month to meet Kim Jong-un, according to a senior official - Bolton is far more interventionist, and a far greater neocon than McMaster ever could be. Last month, Bolton authored an op-ed in the Wall Street Journal arguing that preemptive strike against North Korea would be justified based on Daniel Webster's "necessity test." These views would qualify Bolton as perhaps the most hawkish member of Trump's national security team - which shouldn't be taken lightly given that Pompeo, an uber-hawk himself, is also a member of that team. In other words, with Bolton's arrival, the likelihood of a far more aggressive foreign military policy will surge, which means that not only is the Iran deal virtually finished - with bullish consequences for the price of oil as over 1 million barrels of Iranian oil are taken off the market as a result of a new economic blockade of Tehran - but tensions surrounding North Korea are likely to return front and center, as Trump's attempt at detente crashes and burns under his new neocon security advisor.